So you’re starting a new ministry. Or a blog. Or a worship band. Or a speaking ministry. Or a small group. This year, as you face 2019, you have plans to do something great for God. Perhaps the platform you’re stepping onto is so small your toes hang off the edge, yet you have a big desire to serve Jesus so you step up anyway! You would love nothing more than to see your messages of Truth and hope sink into people’s’ lives, then spring up into orchards loaded with spiritual fruit. Am I right? Plaster the Internet with posts, links, photos, and videos about your new ministry venture? Lock yourself in your prayer closet and trust God? Okay, I see your hand. You’re asking for an Option C, right? As influencers who want to multiply spiritual fruit and bring God glory, we quickly run into an obvious tension. Everyone tells us to make some digital noise. They say we need a platform if we ever want our message to be heard. It’s the world we live in, right? But as Christians, we’re not of this world. We’re citizens of heaven, where the “greats” are those who serve everyone, not impress everyone. We’re called to humble ourselves, not lift ourselves up. 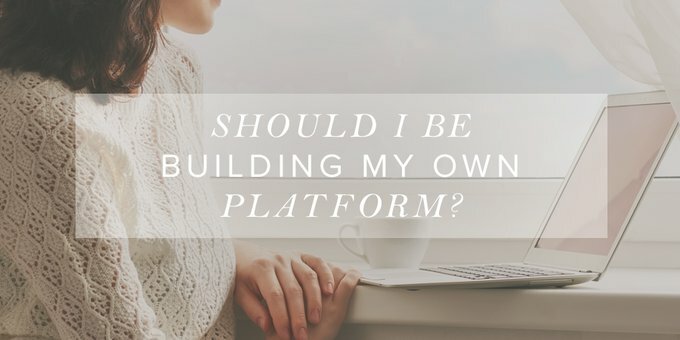 So as influencers who want to exalt Jesus, not ourselves, how should we approach platform building? We live in a splendid day for getting messages out. Live feeds. Free web hosting. Ever-expanding social media platforms. With minimal effort, I tap “publish,” and my words whoosh around to the other side of the world! Like never before, I have the potential to scatter seeds of Truth far and wide. But this plethora of options create a plethora of decisions, such as: Should I invest in a logo? A website? A web designer? Pay for ads? Hire a photographer? Buy postcards? Spend ten hours a day making free memes? And the question underlying the rest is this one: What does God want me to do? Is He pleased when I employ strategy and capitalize on the digital network that expands under my fingertips? Or would He be more pleased if I chose option B and left the multiplying work completely up to Him? Thankfully the Carpenter from Nazareth offers coaching sessions to platform-builders like you and me. If we lean in, He’ll show us how to swing a hammer like He did. Jesus once had an important conversation with His disciples, just after He told a large crowd a story about multiplying spiritual fruit. Most of our Bibles label this story “The Parable of the Sower,” but the focus is really on the soils, not the sower. The sower just tossed seeds indiscriminately, and the ones that fell on hard-packed soil or among rocks or thorns did not produce any fruit. But the seeds that sank into the good soil produced an amazing harvest. This harvest is what we’re after as Christian workers. As we speak and lead and serve, we long for people to be changed by our seeds of Truth! Now we realize that like fruit on trees, spiritual fruit ripens slowly. And we also recognize that God is the One who brings seeds to life. But as eager influencers, we can’t help but wonder: Is there something we can do to help the multiplication process along? Encouragingly, Jesus says there is something we can do. Consider the fact that these twelve disciples (minus Judas)—all huddled up with Jesus, asking Him to explain the parable—will soon become primary influencers for the sake of the gospel. These men will start the gospel movement. With that in mind, this is the perfect time to talk strategy, right? Maybe Jesus will share how to catch an audience’s attention or craft a sticky statement. Maybe He’ll offer seed-tossing methods or strategic soil-spotting tips. “No one after lighting a lamp covers it with a jar or puts it under a bed, but puts it on a stand, so that those who enter may see the light” (Luke 8:16). Notice the strategy employed in the imagery of the lamp. You wouldn’t place a lit lamp under a jar or under a bed, for it would either be snuffed out or set the bed on fire. No, you put it on a stand. A platform. You lift it up where others can see and be drawn to the light. Jesus is mixing two metaphors here, which complement each other. The good soil “is the one who hears the word and understands it. He indeed bears fruit and yields” (Matt. 13:23). For each Christian influencer, this is how it begins. We hear and understand. And it makes a difference in how we live. Our fruit doesn’t appear overnight. The seeds have to soften and take root, but over time it becomes obvious that we understand something. The “lamp” of our understanding has been lit—not by a person but by God. One by one, God lights His lamps and then He sets them—strategically—on platforms. And what is our role in all of this? To receive the Truth and shine. This almost seems laughable from our perspective, for what better platform to be able to say, “I was chosen by Jesus for a three-year internship”? These guys needed only to step onto their God-given platforms with their God-given understanding and shine! And isn’t that true of us, as well? I find security in realizing that God—who helps me understand Truth in the first place—has already put me on a stand. I don’t have to frantically try to urge people to enter the room (digital or real) where my lamp shines. I don’t have to cause my audience to be drawn to the light. God is in charge of expanding my reach and lighting new lamps. He is the One who makes my message fruitful. But I am energized by the fact that God is strategic. God expected the disciples to steward their influence and share the good news—not shrink back in fear or intimidation. God is not pleased by a fearful influencer who refuses to step onto the platform already laid for her or use the influence God has allotted her. Like in the parable of the talents, she is to invest what she’s been given, not bury it. This includes her influence. Philippians 2:15–16 tells us to “shine as lights in the world, holding fast to the word of life.” Like good soil, we hold fast to Truth. And like pin drops of light against the darkness, we shine. “Take care then how you hear, for to the one who has, more will be given” (Luke 8:18). As soil receiving the Word, and as lamps being lit with understanding, we must take care how we hear. Whether we’re writing a blog post, preparing a message, gathering material for a coaching session, or preparing to launch a ministry, we must quiet ourselves and listen well. It would be foolish to step out onto our platforms to speak, share, and give without first taking care to hear from the Lord. Friends, may I speak candidly? Perhaps those of us who spend exorbitant amounts of time, money, and effort on building our platforms should set our hammers aside and just listen. With our Bibles open and hearts tender, we should stop pounding nails and wait to hear the voice of God! This is how we receive. This is how our lamps become bright. There is absolutely no substitute for listening. I’ve noticed that if I try to speak or write on something I’ve pulled from a file on my computer, my words are spiritually empty. They are like seeds hitting cement, falling into the rocks, or scattering among the thorny weeds. The only time I truly have something to share is when I soak my heart in God’s Word. There in the quiet, the seeds unfurl and come to life. Once the Truth begins to sprout in me and produce fruit in my life, that’s when I’m ready to share it with others. So, should you plaster the Internet with news of your new ministry venture? Perhaps. The Internet is a great tool for seed-tossing, sharing the message God has planted inside of you, and shining your light digitally. And should you lock yourself in your prayer closet? Absolutely! Pray that God would do His multiplying work, for He’s the only One who can grow true spiritual fruit. But each time you approach the platform God has strategically placed beneath your feet, first take time to listen well. For without first receiving Truth, you’ll have nothing to share. As an influencer for Jesus, don’t puff up in pride. Don’t shrink back in fear. Just step out bravely and shine! Are you a speaker, writer, or ministry leader interested in growing your platform? We’re giving away three copies of Shannon Popkin and Kate Motaung's new book, Influence: Building a Platform that Elevates Jesus (Not Me). Register to win by sharing this blog post, then entering below. Check out Shannon’s site for more resources!